1. Boil the kettle (ready for step 3). Heat the oil in a wide pan, then fry the meatballs for 7 minutes over a medium heat until golden. 2. Stir the ras el hanout around the meatballs, sizzle for a few moments, then add the tomatoes, chickpeas and 400ml hot water. Bring to the boil then, with a lid just ajar, simmer for 15 minutes until the meatballs are thoroughly cooked and the sauce has thickened a little. 3. Meanwhile, put the greens into a large bowl and cover with freshly boiled water. Set aside for 10 minutes until the leaves are bright and tender, then drain well. Stir into the meatballs, season to taste and serve with dollops of the yogurt. 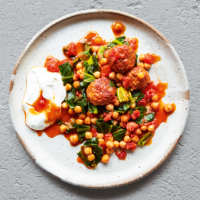 Cook’s tipAs an alternative to the harissa chicken meatballs, try with a 300g pack Waitrose British Beef Meatballs (50% Reduced Fat) and adding an extra 1/2 tsp of ras el hanout.